Includes a full-color eleven-page storybook. Vinyl is Very Fine. Sleeve is Fine Minus. Vinyl is Fine Plus. Sleeve is Very Fine Minus. Vinyl is Fine. Sleeve is Fine. 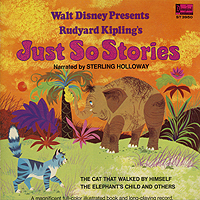 Narrated by Sebastian Cabot, Sterling Holloway, George Sanders and others. Vinyl is Fine. Sleeve is Very Fine Minus. Vinyl is Fine Minus. Sleeve is Fine Plus. Vinyl is Fine Plus. Sleeve is Fine Plus. Narrated by Cliff Edwards as Jiminy Cricket. Vinyl is Very Fine Plus. Sleeve is Fine Plus. Vinyl is Very Fine. Sleeve is Very Fine.